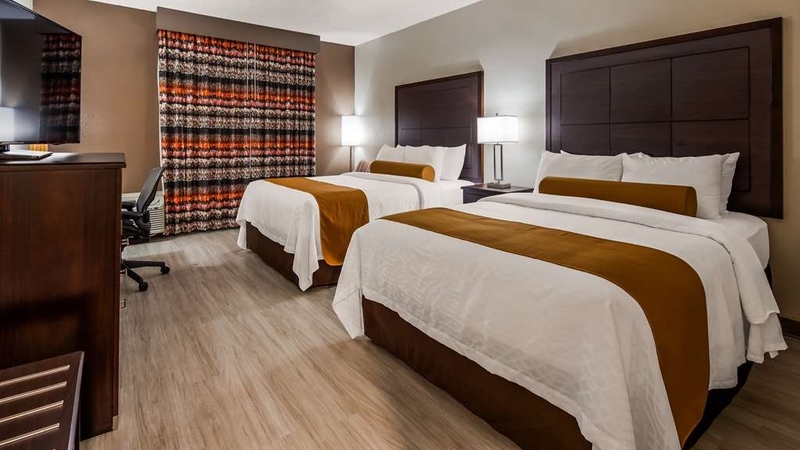 El SureStay Plus Hotel by Best Western Kansas City Airport se encuentra en el centro de Kansas City. Venga y disfrute de las mejores atracciónes turísticas cerca de nuestro hotel. Precios bajos garantizados y ofertas exclusivas. 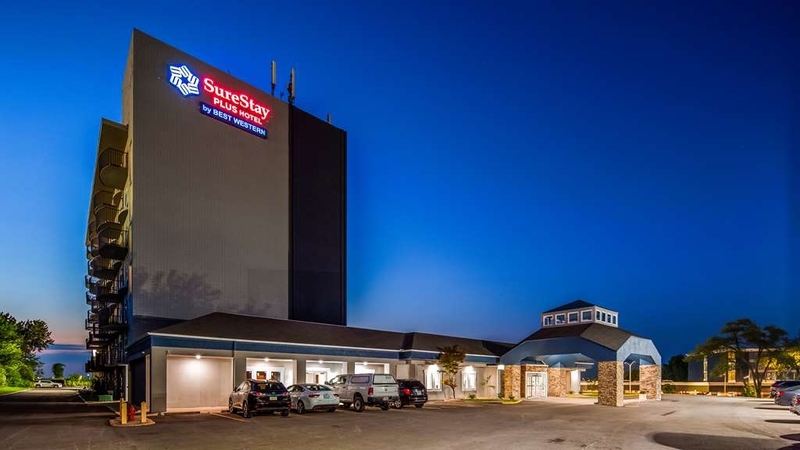 El SureStay Plus Hotel by Best Western Kansas City Airport goza de una estratégica ubicación junto al aeropuerto internacional de Kansas City (MCI). Tanto si se encuentra aquí para desplazarse al aeropuerto internacional de Kansas City, asistir a una convención en el recinto KCI Expo o simplemente para explorar las numerosas atracciones de Kansas City, Missouri, podrá disfrutar de todas las atracciones del área metropolitana de Kansas City a solamente unos minutos de nuestro hotel. Disfrute de nuestros paquetes con Alojamiento y Vuelo con servicio de transporte gratuito al aeropuerto incluido. Aquí estará situado, igualmente, a menos de 10 minutos del centro de convenciones KCI Expo, las tiendas y restaurantes de la zona y el distrito comercial Zona Rosa. Kansas City cuenta con una gran variedad de atracciones entre las que se incluyen el centro de la ciudad, con algunos de los mejores restaurantes especializados en barbacoa de Estados Unidos, tiendas y restaurantes en Country Club Plaza o los partidos de los Kansas City Chiefs, los Kansas City Royals y los del equipo de fútbol Sporting KC. Visite el circuito de Kansas City para disfrutar de una experiencia realmente inolvidable en una carrera de la NASCAR®. 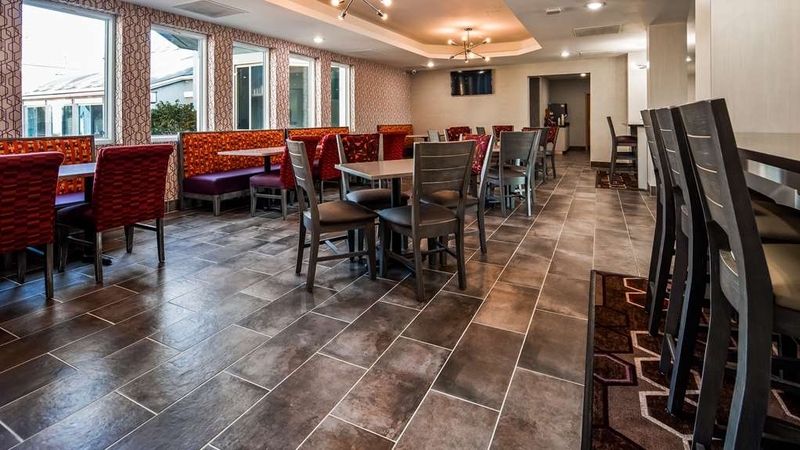 En las inmediaciones de este hotel de Kansas City que admite mascotas encontrará otros muchos enclaves locales, actividades y atracciones como KCI, Tiffany Springs y estadio Kauffman. Nuestro hotel está situado, asimismo, a poca distancia del aeropuerto internacional de Kansas City, Fort Leavenworth, el enclave Historic Weston, el Sprint Center, Worlds of Fun y Oceans of Fun y el centro de Kansas City. También podrá acceder fácilmente a la estación de esquí de Snow Creek, el circuito Kansas Speedway y varias bodegas y salones de celebración de bodas, entre los que se incluyen Weston Red Barn Farm, Eventful at Locust Grove, Pirtle Winery, Weston Brewing y Jowler Creek Winery. Nuestro bar se encuentra cerrado por obras de reforma. Rogamos disculpen las molestias ocasionadas. "Great staff and very nicely updated from what it was"
This place Used to be in real bad shape. It is complete turn around from what it was to what it is. Love the new modern and updated look. Seems like they are still working little at a time to make it more beautiful. Keep it up guys. Extremely satisfied with our stay. Rooms were clean and very comfortable. The breakfast choices were good and the area clean, very comfortable all around. Highly recommend and will be choosing to stay at this property again! Dear Explorer00580818996, Thank you for staying with us and for sharing your wonderful review! It means a lot to hear from guests who are extremely satisfied with all of our services and amenities. 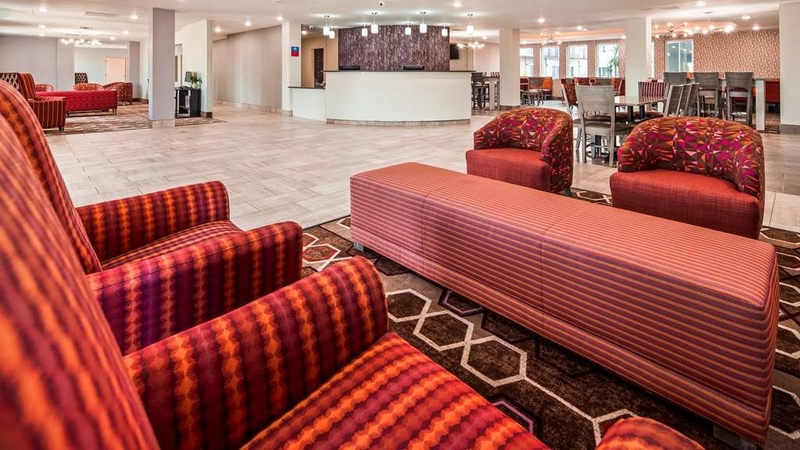 We are so glad that we were able to provide a clean and comfortable stay. Thank you for the five-star rating and for the recommendation.We look forward to having you stay with us again. Considering the price payed for one night stay I couldn't complain. The bedroom was clean and the bed comfortable. They offer a 24/7 coffee for free but is horrible. Breakfast was included and wasn't the worst I've had. Dear leocfaria, Thanks for taking the time to share your review and the feedback. We are glad that we were able to provide a clean and comfortable stay and will definitely work on your observations to improve our services and accommodation. You can expect a further improved stay and have a five-star experience. Looking forward to your next visit. 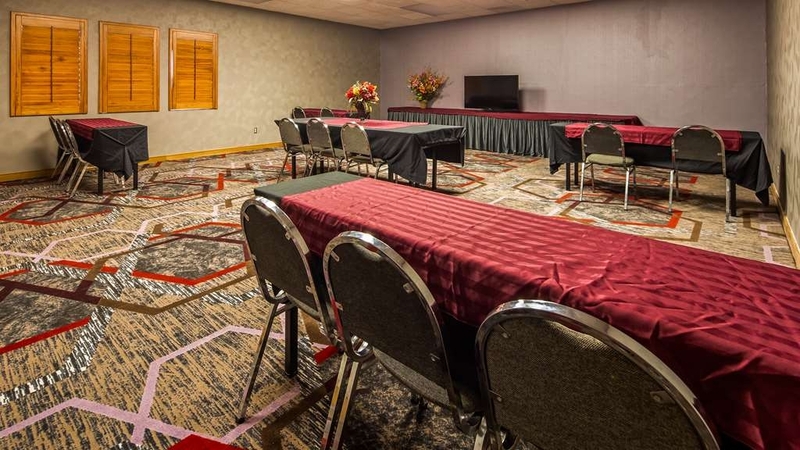 Rooms were reserved at this hotel as part of a stay and play for a volleyball tournament by a hotel parent. The quality of the cleanliness, decor, and lighting is very poor. Many of the rooms were dirty and recent upgrades were sloppy. Dear MIndi, Thank you for taking the time to share your review. We are very sorry the cleanliness of your room wasn't up to our typical standards and I apologize for the negative impression we gave you. We will use your comments as a training opportunity with our housekeeping team. "Not much more than a place to sleep"
Check in was less than friendly. Was told we should have called them to book directly, since we wanted the parking package while we are on our trip. Felt like we were putting them out when asking to take advantage of paying to park while we fly. Floors seemed dirty/sticky, had an open hole in the wall where an old thermostat seemed to be. 6th floor has barely any water pressure, and I took a luke warm shower, at best. Bed was comfortable, so I did get a decent nights sleep. And nice to have an early morning shuttle to the airport (4:40am!). Cloudy pool little hospitality. Pool had floating spit and debris, informed staff with no effort. Hotel lost water pressure and did nothing for the trouble. Rooms were nice and clean. Needs overall basic upkeep. Thank you for the feedback about your stay with us. My team and I would like to apologize for not providing you with a great experience at our hotel. Our pool is a salt water pool and what you saw was not spit or debris but simply a reaction to what sometimes happens when we "treat" the pool to keep the ph levels within range. The issue with the hotel having no water was due to the city shutting the water off to part of N. K.C. due to an accident involving a fire hydrant. We had no warning this was going to happen and it was completely out of our control. We hope you will stay with us again so that we have the chance to provide you with the experience all of our guests deserve. We parked our suburban here while our family was on vacation in Florida. When we returned our car was gone. The manager was completely rude and refused to help us in any way. They refused to give us a ride to the impound lot, refused to call us a cab, and refused to give us our money back. After speaking with KCPD, I found out that this establishment lets drug addicts loiter in the parking lot. DO NOT PARK HERE!!!! Mr. Edwards, We deeply regret for such an incident that occurred on our property. After speaking with KCPD regarding your vehicle we were informed that the CAR KEYS WERE LEFT BY WINDSHIELD WIPERS. That is an open invitation for theft. We have no such issues at our facility regarding any drug addicts or vehicle damages; however, we can not control the entry to our lot to any specific person. For Safety and security We do advise each guest to be sure to lock your vehicle, hide your valuables and take your keys with you. Leaving the CAR KEYS OUT IN VISIBLE is not something we recommend at all. This notice is also printed on our parking tag. We can not control any damages or theft due to guest negligence. Once again we apologize for the inconvenience you had at our facility. "Horrible hotel. Horrible management. Horrible surveillance of their parking lot. DO NOT STAY HERE OR PAY TO PARK HERE!!!" Our car got STOLEN from their parking area while we were on vacation! Not even so much as an apology from the manager or offer to help us find the impound when we returned from FL! Awful experience!!! Mr. Edwards, We deeply regret for such an incident that occurred on our property. We have no such issues at our facility regarding any drug addicts or vehicle damages; however, we can not control the entry to our lot to any specific person. For Safety and security We do advise each guest to be sure to lock your vehicle, hide your valuables and take your keys with you. This notice is also printed on our parking tag. After speaking with KCPD regarding your vehicle we were informed that the Car Keys were left Just under the hood by where Windshield wiper rests. That is an open invitation for theft. We can not control any damages or theft due to guest negligence. Once again we apologize for the inconvenience you had at our facility. I booked this hotel the night before a 7 AM flight out of MCI. It ticked all the boxes: only 3 miles from the airport, pretty easy to find with a good GPS (in a complex with other hotels), frequent shuttles. Note that if you're using the Park and Fly package you have to park behind the hotel after unloading. The hotel appears new or newly-remodeled; one aspect I rarely see is tile floors rather than carpeting. Probably much easier to keep clean but it was cold to my feet before the heat kicked in! Room was equipped with a coffee maker, microwave and mini-fridge. There was a fitness center but I didn't check it out. Wake-up call came as requested and they were able to accommodate me on an earlier shuttle than I'd booked when I was ready early. I left before breakfast was out but it had a reasonable variety of things: waffles, cereal, yogurt, 3 types of juice and a basket of apples. I was grateful for the in-room coffee maker. Good stay and would use again. Sure Stay is fairly new, and part of the Best Western family, but don't think Best Western here, as the hotel does not try to emulate BW. 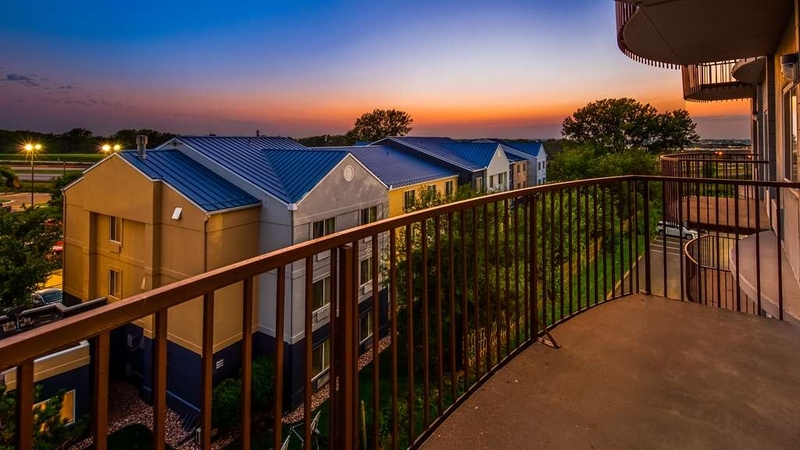 It is extremely affordable and for a business trip exactly what was needed over five nights with no time spent there during the day. 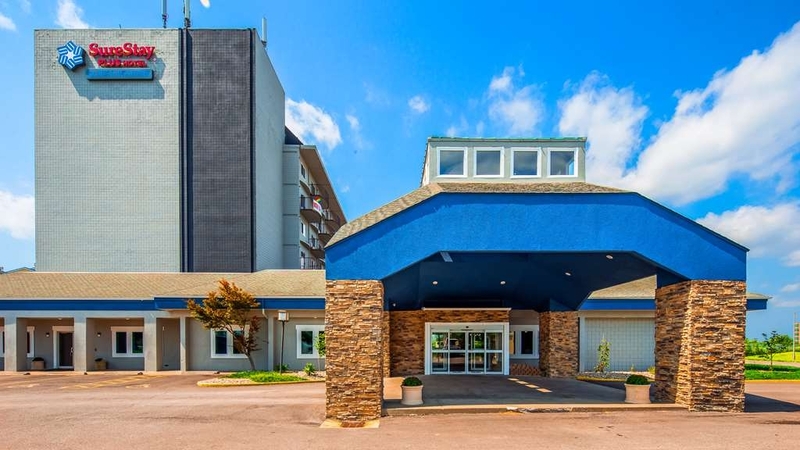 Shuttle service to/from MCI Airport and/or rental car agencies (both 5 minutes away) was frequent and easy, morning breakfast more than adequate, and the king bed was extremely comfortable, so large that one side of it may have been in Kansas, not Missouri! The staff were very accomodating and attentive, and all seemed trained to do anyhting required, covering and helping each other. Only two items were of concern: 1) both the bathroom sink and tub drains backed up and it took two days to get those fixed; 2) my 7th floor room had no water pressure in the shower and the “hot” water was warm at best. The sink was fine. That never changed. 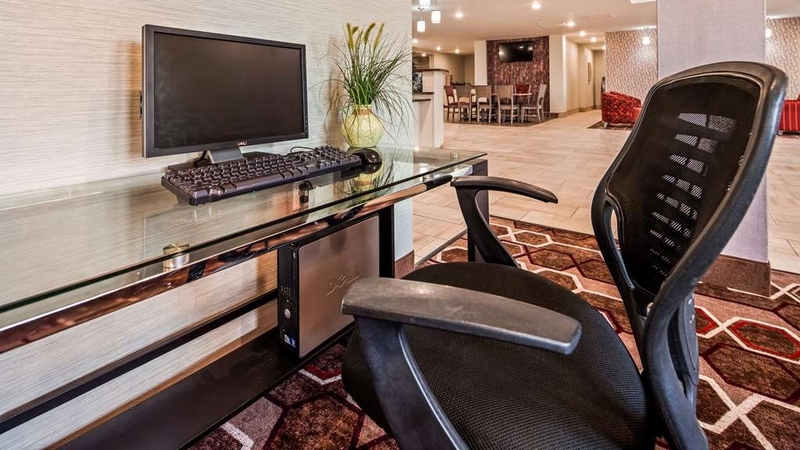 But for a business stay only 20 easy minutes to downtown Kansas City at a rate that can't be beat, SureStay is THE place with incredible convenience to the airport. Our hearts overflow with joy for all the kind and flattering words you wrote. Can't thank you enough for this amazing review John! We are indeed grateful that you find our place excellent and comfortable. 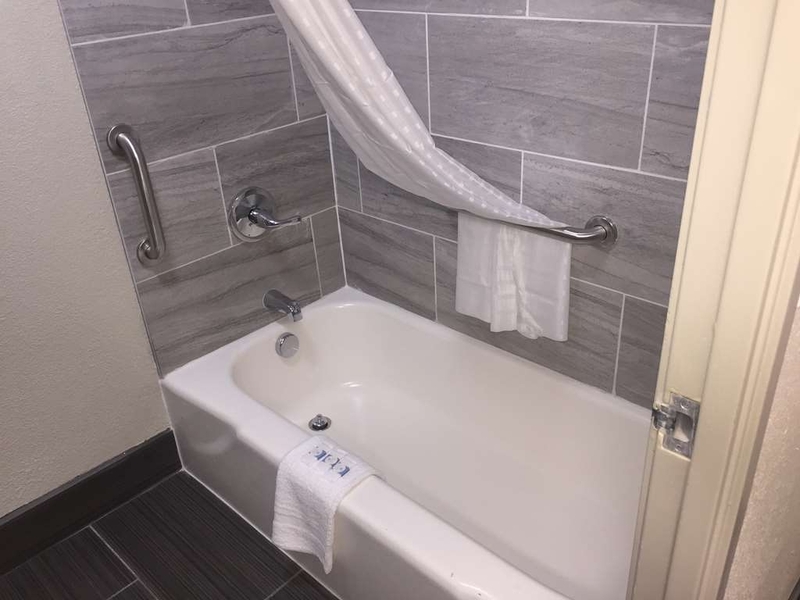 We appreciate that you've taken the time to share ways that we can improve such as the bathroom sink/ tubs and the floor room. It's important for us to impress our guests and your comments will make this goal that much more attainable. Thank you for taking the time to let us know how you enjoyed your stay with us and we look forward to your next visit. We parked before our trip. The shuttle was very nice, driver was very helpful. When we returned it was late and after gathering our bags we called them and they picked us up within 5 minutes. The room was clean, warm, and comfortable. We will definitely stay again. Dear J9794GUdianaa, Thank you for sharing your heartwarming and flattering review. Thank you so much for your compliments to our free shuttle service. We are so delighted that we were able to provide clean and comfortable accommodation. Thank you for the high rating and looking forward to your next visit. The room was nice when you first look. Balcony was pretty on a snowy day. Closer look at the room, was a little ghetto. The outlet was crooked like super crooked. And then we tried to see if we could plug something in to it. Didn't even work. There was blood on the wall, gross, and I know someone saw it because I noticed it first thing when I turned around. The floor was not swept or mopped. I went to take a shower and the drain to the tub was so stopped up that there was still water in the tub 2 hours later slowly draining. The breakfast was disgusting, water down fake eggs and the gravy was straight liquid with something that sort of looked like sausage. The only thing that was edible was the prepackaged yogurt. I would never go to this hotel again. Not even at an even more discounted rate than what I paid. Dear Valued Guest, We are very much concerned with your feedback. Our apologies for the bad experience. Our endeavor is to offer a nice and clean stay to all our guests but failed this time through our own standards are very high and include checking up to ensure that rooms are as clean as can be. Actions shall be taken to improve everything on priority and you can have a good stay next time. I am sorry to hear that you did not thoroughly enjoy the breakfast options, and I want to let you know that we take your suggestions to heart and make sure to improve our breakfast options. Again, I want to apologize for the inconvenience that you experienced. We hope to see you again someday and to transform your opinion of our hotel and service. "clean. 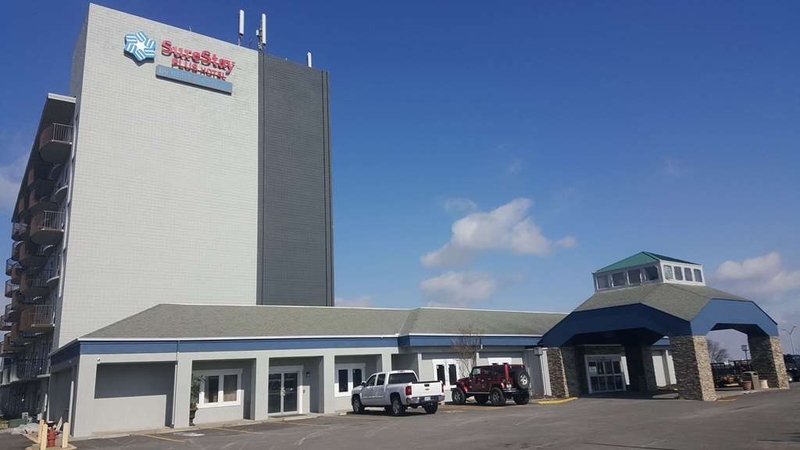 comfortable beds, efficient shuttle"
will return to this hotel when flying out of MCI. staff courteous with very understandable English, clean room and comfortable beds. only thing I'd change was I had to unplug fridge to charge my phone. There was 1 outlet for the TV, fridge, microwave, and lamp at the desk. Hi Robert, We are happy to hear that you enjoyed our service and your stay! Your kind compliments mean so much to us, and we thank you for taking the time to share this review. We are indeed grateful that we were able to provide clean and comfortable accommodation. Your feedback will serve as encouragement to all of our staff as we strive to provide an exceptional and memorable experience for every guest. Thank you so much for giving our hotel a five star review and we look forward to serving you again. "Perfectly fine for pre-flight stay"
Thank you for leaving us a great rating and review. We are pleased that you were able to relax with peace and quiet and enjoy a nice hot breakfast. Thanks for choosing our hotel and we look forward to providing you with another great stay in the future. Great hotel . The staff is very helpful, clean rooms and reasonable rates. Great location. Near pleanty of restaurants and right off the highway. Shuttle service to the airport if you need it. All around great place. A big thank you JORGE for the heartwarming feedback. We appreciate your kind compliments to our staff, rooms and our location. We are so happy and we were able to give you a clean and comfortable accomodation. Thank you for rewarding us with your five star review and we look forward to serving you again. I had a reservation at the SureStay for 1am. Temp at time of arrival in KC MO, 16*. My room had NO heat turned on. Temp at time of arrival to room, 54*, at 11am check out it had climbed to a whole 58*. I am attributing this to body heat. At 5am, they did offer to move me to another room with NO heat on. Customer service, POOR. SOOOOOO, my moral to this story, if staying here, take your own heat. Dear Sherpa36309287827, Please accept our sincerest apologies for the inconvenience that you encountered during your stay in our hotel. We take all reports of lacking service and issues with amenities and accommodations seriously, particularly for not having a heater at this season. I want to assure you that we respond promptly and make sure that lacking amenities like this will not be missed . Thank you for bringing this matter to our attention so that we can make sure no future guest experiences the same inconvenience. I only paid 88 dollars for a nice room. I didnt have any real expectations for the price, but It was nice. Staff was nice and the shuttle was fine. The gym is terrible, but didnt effect my experience. Thank you for leaving us feedback about your stay with us. My team and I strive to make each and every guest feel welcome and to make them as comfortable as possible and we are pleased to hear that you enjoyed your stay. I will be sure to pass your kind words along to my staff and shuttle drivers. We hope we see you again soon. Stepped & slid in vomit at door in brand new shoes. Desk clerks could care less. Stood there for 20 mins before 1 would even look at where it happened. No offer of help cleaning my shoes. Sink clogged in room for 4hrs before they fixed it. Shoes smell like vomit for my first cruise ever! Very unhappy. Hi Maps64887040784, Please accept our sincerest apologies for the housekeeping issues and cleanliness that you encountered during your stay in our hotel. On behalf of our entire team, I would like to apologize for failing to exceed your expectations. Thank you for bringing this matter to our attention so that we can make sure no future guest experiences the same inconvenience. Beds were hard and our bed linens were not clean. Also, the breakfast, while free, was inedible and cold. The hot tub was broken and the front desk said it won't be fixed “any time soon”. I will not be returning to this hotel. Thank you for the feedback about your recent stay with us Telling us what you liked and disliked about your stay helps us to make changes necessary for our future guests to have a great experience staying with us. We value you as a guest and hope you will give us another chance. We stayed at this hotel in November, 2018. It is ok for the rate. The check in staff was very nice and fast. The hotel was under some remodeling, so there are some things left to do. Upon return to Kansas City, I called the hotel for a ride and was advised that service ended at 12:00 midnight. I ask what time it was and was told 12:02 and was advised that they would not pick us up. I had to find a cab at midnight. For this reason, we will not be staying at this hotel again. Thank you for your response to our survey. On behalf of my entire team and myself, I would like to apologize for any miscommunication between shifts that caused you not to stay. I do hope you will give us a chance to change your mind about us and book with us again. "Mini vacation - Melissa D."
Took our kids on a mini vacation away from home , even though they are going through renovations we enjoyed our stay,staff was very friendly, breakfast was nice,room was awesome,we will definitely be back again. Thank you for your feedback. My team and I work hard to make sure our guests are comfortable and enjoy their stays with us. We are glad you liked the new upgrades and we look forward to seeing you again. "Price $5 higher than booked through BW"
Booked this hotel thru BW a month in advance using my Gold Membership number. Price was $5 more on check in than my BW reservation...Had my guarantee in hand. Did not honor my price because I made it thru BW. ?? Never have had this problem with any hotel chain. I finally ended up talking to BW customer service and a refund will be issued to my card on file. Hopefully. Staff was friendly, room was ok..apparent that the hotel is under remodeling. Many areas where cleanliness is an issue. Management needs to step in and get things under control..perhaps they opened too soon, before they were ready. Won't stay again. Thank you for providing us with feedback about your stay. I would like to apologize for any inconveniences you experienced while in our hotel. I'm glad my staff and BW were able to provide you with your accommodations at the rate you reserved. I understand your frustration with the small amount of renovations we are completeing but I hope you will give us another chance in the future. 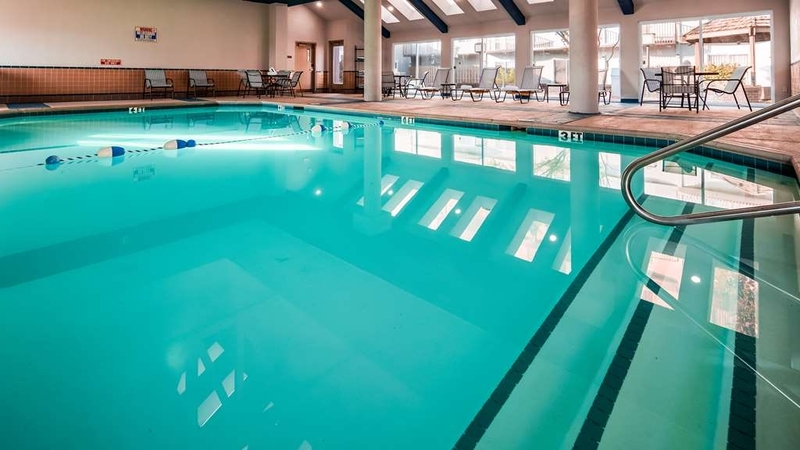 I hope you did get to experience our indoor swimming pool or fitness center during your stay but if not, maybe next time. Again I do apologize your stay did not exceed your expectations and thank you for being a Rewards Member. "Very convenient to the airport. Clean rooms. Airport shuttle"
Stayed at this hotel the first and last night of our week long visit to Branson. I chose this hotel because of the location close to the airport, the price was reasonable and I prefer the Best Western chain. The hotel has obviously been recently renovated/redecorated (not quite complete) and had large comfortable rooms. We found the bed comfortable and the room clean. I like that the carpet has been removed and replaced with laminate/tile. You never know what is hidden in the carpet of hotel rooms. We had a long delay checking in the first night due to a computer problem, which obviously was out of their control, but it was frustrating that they did not offer to put us in our room while they tried to fix the problem. After an hour+ I asked to please get a room. We were tired from a long day of travelling. After some paperwork and ID photo copies we finally got to the room and signed in later. The breakfast is average, convenient and appreciated. The staff were polite. There are a few negatives. Both stays we had problems with the Wifi constantly dropping. Had to log in with the password way too often. And... there were plumbing issues in both the rooms we stayed in. First night, Rm 613. When I pulled the shower leaver up on the water spout, the spout came off the wall and spun around. So... I pushed it back into place. The toilet did not flush properly. Seemed like the tank was not filling properly. I took the lid off and noticed the water draining as It came in. To solve the problem I pushed down on a piece of plumbing in the tank which let the tank fill up and I was able to flush. Rm 710, our second night, the sink tap has the hot and cold reversed, and this time the water handle in the tub/shower fell off when I turn the dial. Seems the plumbers are not paying attention to detail. Lastly both rooms had Poor water pressure in the shower and the drain would back up. Did I tell someone at the front desk when I checked out...yes! But they didn't seem all that concerned or interested. Would I stay here again? Maybe... but not likely to be in Kansas City again. We appreciate your feedback and value you as a guest. We do apologize for the inconveniences you experienced and do hope you will give us another chance when renovations are completed and if you are in the area again. Thank you for your loyalty to our brand. Thank you for your feedback. I'm sorry that your stay with us wasn't a great experience but hope you will give us another chance as we are improving everyday. I'm sorry you were not happy with your hotel stay. 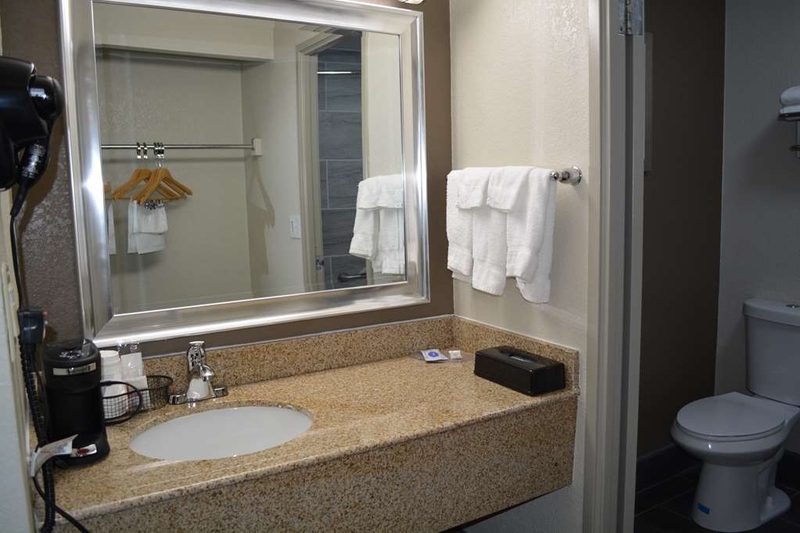 Per hotel policy we do charge $150.00 for smoking in any of our rooms as we are a non-smoking facility. 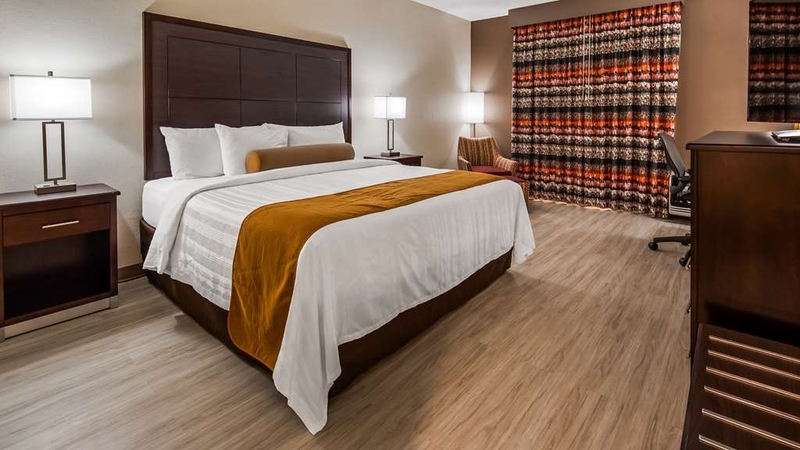 We are glad you liked the newly remodeled rooms. This stay didn't “wow” me by any stretch of the imagination. You can tell they are “hiring” as they seem really understaffed and I'm guessing the staff they do have is wore out from doing several jobs like front desk/cleaning/breakfast. It's being re-branded and renovations are being attempted I think but it just wasn't a place I'll stay at again (and we are in KC quite a bit). Room was clean, breakfast was “ok”. Didn't even get asked how our stay was at checkout. I would like to apologize for your stay not exceeding your expectations and am disappointed to hear you will not be staying with us again. We did just recently reopen from renovations and upgrades and would love for you to give us another chance when everything is completed. It has been recently refurbished with new beds and furniture. The new pillow top mattress was great and the property is quiet. I felt bad for the owners as I looked at the quality of the construction work. Our room was clean, but the halls and elevator have lots of construction dust and dirt. Only one working ice machine on 4th floor. Once it is cleaned up, it may be an ok place. I'm just glad my wife is a good sport! I'm sorry your stay with us was not exceptional. Unfortunately, it is very hard to keep up with the dust and dirt from the renovations and construction debris. Good news is we have another ice machine in the kitchen and will gladly get ice for guests from it. We appreciate your feedback and hope you will sty again once everything is completed. "Comfortable room, hotel in progress"
I am a Best Western Gold member and chose this hotel to use points and credits. We stayed twice within 10 days. The front desk staff was friendly and helpful. The King rooms were clean, large and comfortable. We stayed on the 6 and 7 floor and there is only one elevator which was old and slow. On our second stay, the fire alarm went off 3 times in the night, we called front desk after first alarm and they said it must be dust from construction. It was a little unsettling. But they are trying very hard and the airport shuttle was right on time and very friendly. Once renovation is complete should be a great budget friendly choice. We appreciate your feedback and loyalty to our brand. I am glad that my front desk staff was able to make your stay enjoyable. As for the fire alarm, I was working the overnight shift that night so I know how unsettling it must have been for you and do apologize for that. We have since had the sensors cleaned with high-pressure air and the problem has been significantly decreased. I hope you will choose our hotel again next time you are in Kansas City. Thank you so much for letting us know how your stay was. We are happy you enjoyed your stay and were able to enjoy the pool and liked the new rooms. We hope you choose our hotel again next time you are in Kansas City and we look forward to seeing you again. Mrs. Gardner, I do apologize for the inconveniences you experienced while staying at our hotel. The early check in fee is policy and not due to availability. As far as not holding your bags I am uncertain of this situation but do know that upon request we do hold bags for guests. Again I do apologize for your inconveniences. We stayed there the night before a 5:30 am flight. $5/day parking. Free shuttle to/from the airport. Close to the airport, and Zona Rosa. 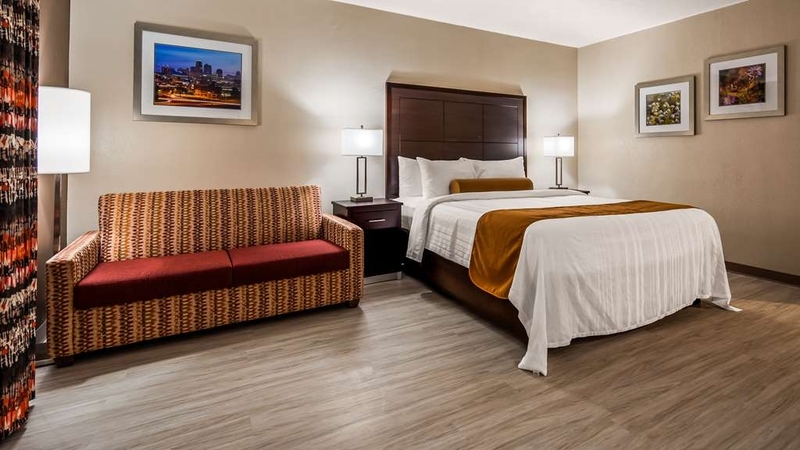 This hotel is a clean, budget friendly place to stay by the airport if you need a quick place to crash. Thank you for letting us know that your stay with us was a great experience. We appreciate the feedback. Please come see us again on your next trip through Kansas City. Best night ever. Angie and Zack were freaking amazing. Thanks guys for everything. Great customer service. Totally friendly and kind and, like I said, friendly. Thank you so much for everything!! ?????? Brittany, Thank you for the compliment. Zack and I along with the rest of our staff are so glad that we made your stay with us a great experience. We are looking forward to seeing you next time you are in Kansas City. Please contact me if I can do anything else for you. Have a great vacation. "Really good price for a remodeled hotel"
I was impressed with the re-model as I have stayed there before. Room was nice and well appointed with a boutique feel. Breakfast was included and they have an airport shuttle. Location is excellent near the airport. 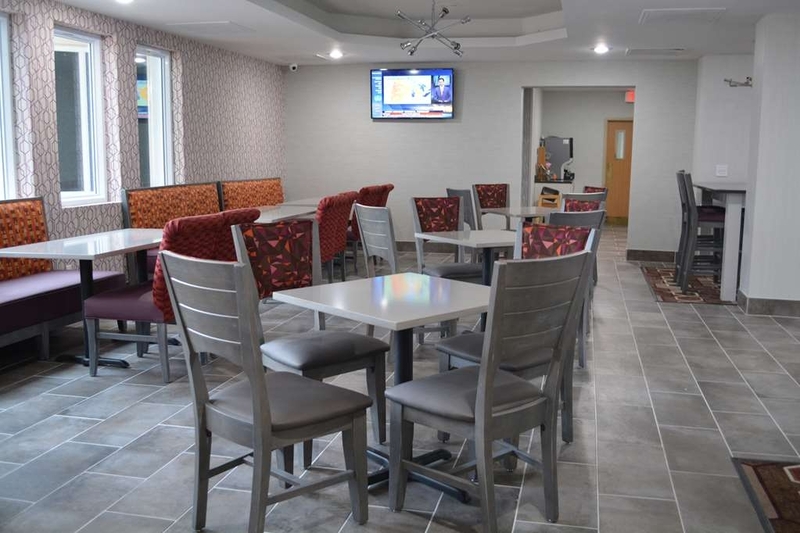 I want to thank you for being a loyal customer to our hotel and standing by us through all the renovations we have done. As a traveler, you have your choice of where you stay and knowing that you choose to stay with us lets us is the greatest compliment we could get. 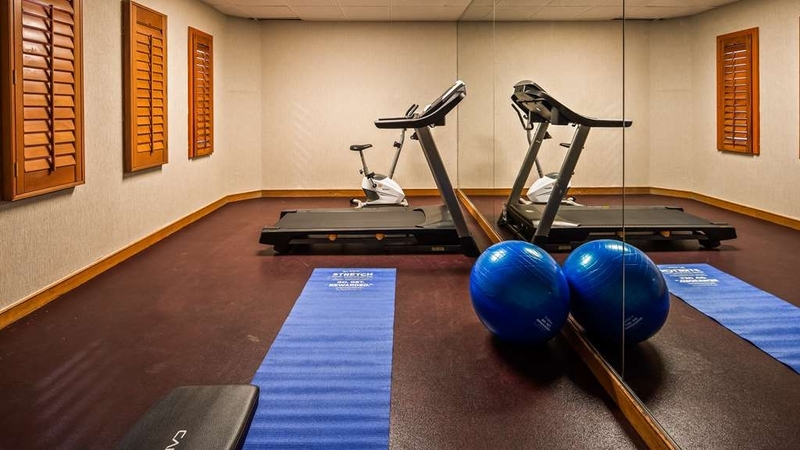 Our indoor pool and exercise center will be reopened very soon and we hope you will enjoy these amenities on your next stay with us. Dear Guest, I thank you very much for giving us a chance to help you with your hotel accommodations need. I am very happy to hear that you enjoyed your stay with us during your business trip. I understand you have a choice of many hotels to stay and thank you for staying with us. We hope to see you again on your next trip to Kansas City.